UFO is an acronym for “Unidentified Flying Object.” While any unidentified aircraft, regardless of origin, counts as a UFO, most people associated UFO with spacecrafts of an other worldly origin — most likely flown by aliens. The most recognizable image of a UFO is silver flying saucers of 1950s and 1960s B-movies, like the flying saucer from the original :War of the Worlds." 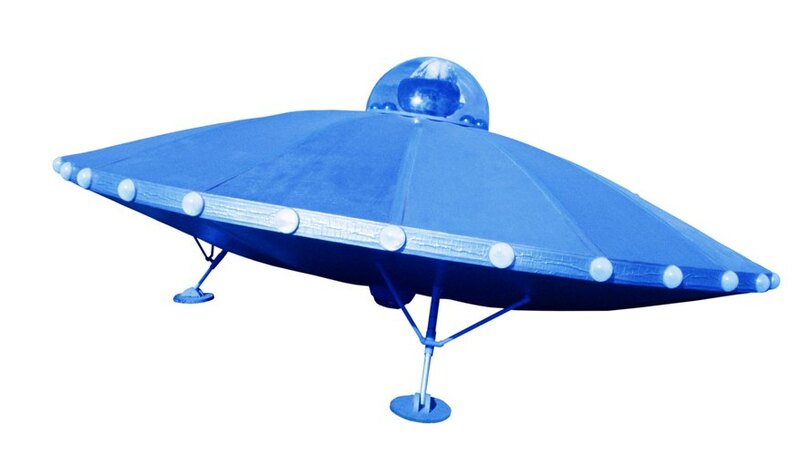 Besides its round, Frisbee-like shape, a model of a flying saucer UFO should include tripod legs and an observation area or cockpit on top of the UFO. Roll a sheet of card stock into a tight cone and tape the cone along its seams to help the cone hold its shape. Cut three 1-inch slits in the open end of the cone to create three tabs. Bend each tab at a 90-degree angle away from the cone. Repeat steps 1 through 3 to make two more cones. All three cones will serve as the legs of the UFO. Turn one of the paper plates over on the work surface with the bottom facing upward and draw a triangle over the center of the plate. Place glue on each of the tabs of one of the cones. Align the center of the cone over one of the points of the triangle you just drew and press the glued tabs onto the plate. Repeat steps 6 and 7 for the other two cones. Turn the other paper plate over on the work surface with the bottom facing upward. Set the paper cup upright over the center of the plate and draw a circle around the paper cup 1/2 inch larger than the base of the cup. Use a utility knife to cut out the circle. Press the bottom of the cup upward from the inside of the plate. Approximately 1 to 2 inches of the cup should protrude from the bottom of the plate. This will serve as the cockpit. Turn over the plate so the cup is right-side up. On the upper portion of the cup sticking through the plate, trace a circle to show where it meets the paper plate. Pull the cup out of the plate. Cut the cup 1 inch above the line you just traced, and then cut five slits around the cup, stopping at the traced line to create five tabs. Bend each tab at a 90-degree angle to the outside of the cup. Press the bottom of the cup upward from the inside of the plate and glue each tab to the inside of the plate. Poke or cut one or more holes through the exposed portion of the cup. This step is optional. The holes will serve as observation ports. You can also draw on windows later, if desired. Cover the plates, cones and cockpit in aluminum foil, wrapping the aluminum around the edges of the plate. Use glue to adhere separate strips of aluminum to one another. Stand the bottom of the UFO on its legs. Place a line of glue all the way around the upper rim of the plate. Press the upper portion of the UFO into the glue, lining up the rims of both plates. Staple around the plate rim for extra security. This step is optional. Science Museum: Do UFOs Exist, and Could My Math Teacher be an Alien?